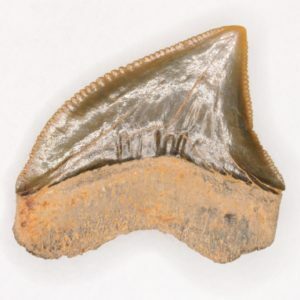 The teeth of the crow sharks vary in shape more than any other species present here. Their teeth are flattened and normally have a greater width than length (in laterals). 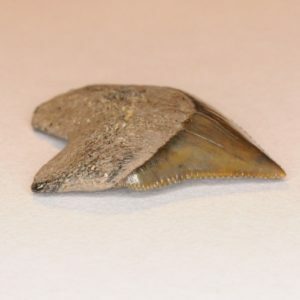 Crow shark teeth are also the only serrated type of shark tooth found here. The ratio between tooth length and width gets smaller as you go further back into their mouth. They don’t really have an “anterior position,” “lateral position,” or “posterior position,” such as in Scapanorhynchus teeth. It is just the tooth angle along with a couple other features that change. Anterior teeth have more of a straight shape, and posteriors are more distally curved. 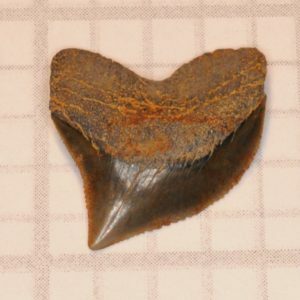 The two types of Squalicorax teeth present are S. pristodontus and S. kaupi. S. pristodontus teeth are larger on average and have a wider angle in the notch on the distal part of the tooth. S. kaupi teeth sometimes possess small foramina on the labial side of the root. S. pristodontus had fewer variations in tooth shape; this likely has to do with the fact that it had fewer teeth in its jaws than S. kaupi. 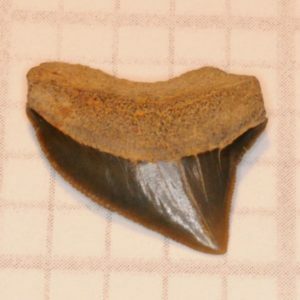 S. kaupi had a slightly smaller body size, but S. kaupi teeth are not smaller solely because of that reason; its jaws were only slightly smaller than that of S. pristodontus, but it had smaller teeth also because it had a higher tooth count. 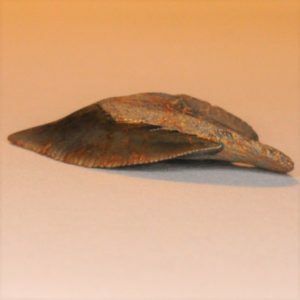 Both species have simplex serrations. 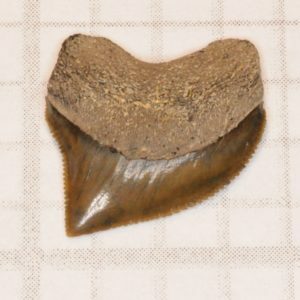 S. kaupi had symphyseal teeth. 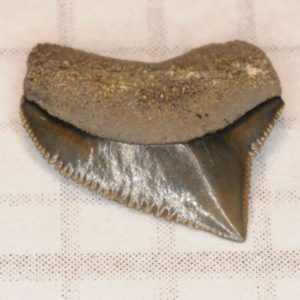 The anteriormost teeth of S. kaupi resemble its symphyseal teeth. The symphyseals are rare and were likely disappearing from its dentition. 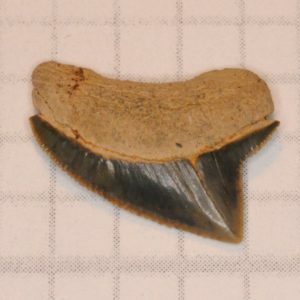 Since their symphyseal teeth are rare, it is likely that not every S. kaupi individual had a symphyseal tooth file in their mouth. The symphyseal teeth are rather strange in appearance. 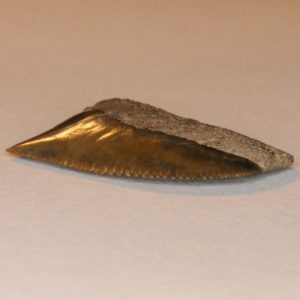 They have a much narrower root (which has one root lobe, unlike other tooth positions which are bilobate) than the usual crow teeth. 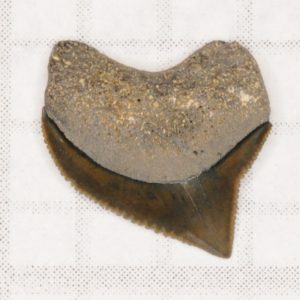 S. pristodontus likely did not have a symphyseal tooth file. 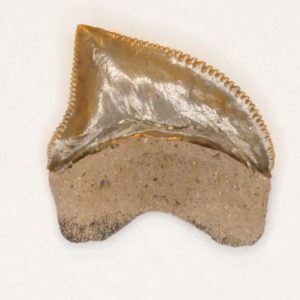 Anterior Squalicorax pristodontus teeth have a greater height and more of a U-shaped root in comparison to lateral teeth. Their distal notch is less distally angled. They are also less common than laterals. This anterior has a different morphology than the one above. It resembles a lateral tooth, but I would say it better matches an anterior. 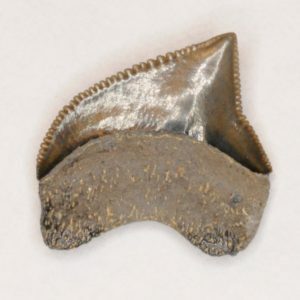 Lateral S. pristodontus teeth are shorter and usually have the same width and height proportions. 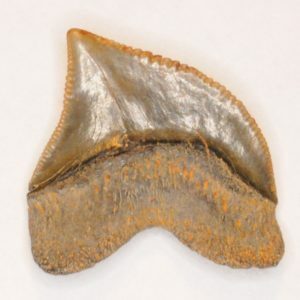 They are the most common type of tooth from this shark’s dentition. 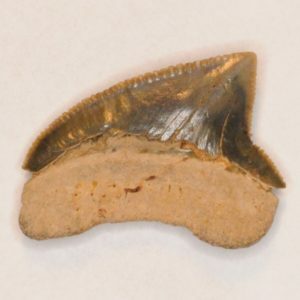 This is a sub-adult S. pristodontus tooth. 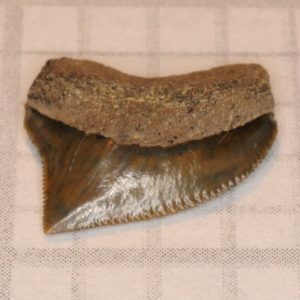 It is significantly smaller and resembles S. “kaupi” teeth a bit more than the other teeth on this page. Most of the S. pristodontus teeth found here are from adults. The distal notch on posterior teeth has a more acute angle compared to anteriors and laterals. They have a greater width to height ratio than the other tooth positions. Posteriors are not as common as laterals.